Across the street from the garish colors and outdoor tables of Pambiché, the strip mall housing Dove Vivi is a calm, unassuming location. A big, black heart on a sign-pole stands in the parking lot. A few people drink beer outside. I couldn’t really tell if the design was supposed to be upscale, hip, or neighborhood-y, but the pans of deep-dish convinced an entrance. The first thing you see when you walk through Dove Vivi’s glass doors is refrigerated display case full of half ‘zas. These must be the source of the individual slices ($3.75) and are, as their website stresses, not pre-cooked. A nice hostess informed us of a short wait and we were seated in approximately five minutes. Not too bad. In terms of décor, I like it. Simple, grey walls, wooden tables and chairs, that exposed warehouse-type ceiling – a little noisy, a little cramped, but not distractingly so. Water was waiting for us at the table in little glasses and a large mason jar. Quite hungry, my friend and I ordered one full-sized Quatro Fromaggio ($18), described as mozzarella, fontina, provolone, parmesan, and tomato sauce, and one half-sized Pepperoni ($10.50), a combination of mozzarella, fontina, pepperoni from the Molinari Salame Co. in San Francsico, mushrooms, and fresh tomatoes. Both of them on Dove Vivi’s signature corn-meal deep-dish crust (the only choice). With a smile, the waitress told us that we were “ambitious.” Yes we were. And then we waited. 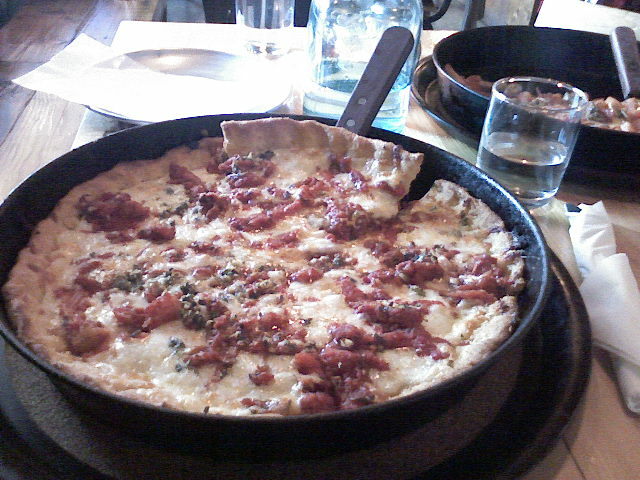 It’s not that the wait was overlong, as deep-dish does take a while to cook, but that our waitress never came back to check on us, inform us of the usualness or unusualness of the wait, ask us again if we wanted something to drink, or anything else. We just sat there and, when I was just about to say that this was getting bad, the pizzas arrived. Generously sized, good-looking, not-quite-piping hot ‘zas. I tucked in, pulling out a hefty slice of Quatro Fromaggio. 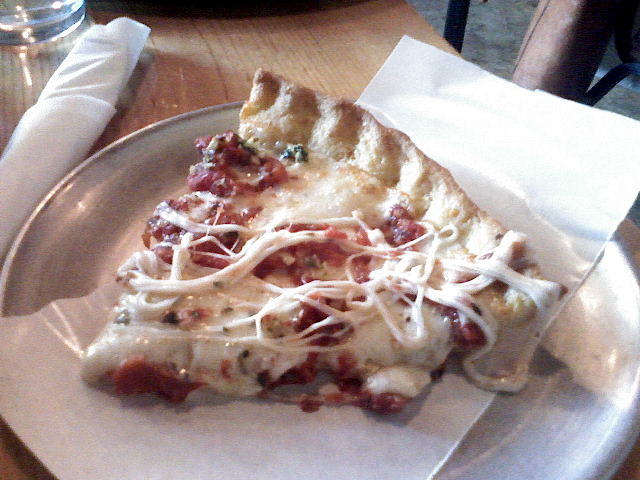 The ‘za was delicious. Definitely one of the cheesiest slices I’ve had in a long-time. Dove Vivi’s cornmeal crust is quite good – it doesn’t become overbearing, but you can certainly taste a difference. Though, I will say that I would have liked just a bit more corn flavor, however crunchy-on-the-outside light-and-fluffy-in-the-middle it was. Smattered across the top of the pie were chunks of tomato sauce – very garlic-heavy, a bit over-salted, but tasty nonetheless. As I mentioned above, there was a whole lot of cheese here. It would have been better to have a little more distinction between the four different cheeses, as they all blended together in texture and flavor, but there is very little to complain about. Overall, very satisfying. I’ll leave the description of the Pepperoni for another time, but suffice to say that I thought it less inspired than the Quatro Fromaggio. Dove Vivi is certainly recommended, but I’d like to see their staff become a bit more attentive. This entry was posted in Artisanal, NE Portland, Thick Crust. Bookmark the permalink.